CCH General Contractors is our Commercial Division, specializing in both new construction and remodeling. With over 35 years of building experience, Bryan is highly experienced in managing commercial building projects of all sizes. The ever-changing Commercial Building Codes are no problem for CCH General Contractors. 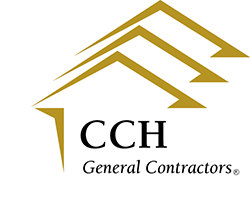 We are fully equipped to handle your project and we have the ability to be bonded, Whether you want to begin a commercial remodeling project, add an addition to an existing space, or build your new corporate headquarters, CCH General Contractors is here for you!